OBIE FERNANDEZ is the CEO and founder of Hashrocket, Inc., a boutique web consultancy and product shop based in Jacksonville Beach, FL, and has more than 12 years of experience as a software developer. As a senior consultant at ThoughtWorks, Fernandez specialized in complex custom enterprise software projects. A pioneer in Ruby on Rails development, he writes a popular blog, is a regular contributor to the Ruby on Rails podcast, and is the Ruby community editor at InfoQ.com, one of the webs premier technology portals. 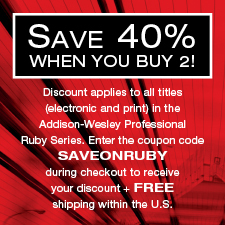 In this book, Russ Olsen helps you write Ruby like true Rubyists do–so you can leverage its immense, surprising power. This package delivers instant skills, answers, and solutions to Rail web programming with 18+ hours of video LiveLessons. This book is the only comprehensive, authoritative guide to delivering production-quality code with Rails 3. The Complete Guide to Avoiding and Fixing Common Rails 3 Code and Design Problems. Learn Ruby on Rails fast, by walking through the development of a substantial, real-world application! Paul Dix introduces a powerful, services-based design approach geared toward overcoming ways to interface with legacy systems, move into the cloud, and scale to handle higher volumes and greater complexity. Through examples and sample applications, this book explores and examines third party tools and the tools available within the standard Ruby library to build distributed applications with the Ruby language. Blends the original content of Martin Fowler's Refactoring with lessons of the past 10 years, resulting in a thorough demonstration of how Ruby practitioners can realize the significant benefits of Refactoring. Thousands of Ruby and Rails developers are discovering the extraordinary scalability, agility, flexibility, and performance offered by the new Merb MVC framework. The Merb Way is the first comprehensive guide to using, extending, and deploying Merb. from Model-View-Controller architecture to automated testing, refactoring to REST. The very differences that make Ruby a wonderful tool for building programs also make it a difficult tool to completely master. By explaining how to do something that is both complex and familiar (implement design patterns) in Ruby, this book helps software practitioners bridge the conceptual gap. This classic "how-to" practical reference guide to the Ruby programming language, written by experienced rubyist Hal Fulton, has been painstakingly updated to cover the latest features of the Ruby language and the arrival of Ruby on Rails. Ruby on Rails is fast displacing PHP, ASP, and J2EE as the development framework of choice for discriminating programmers. Using a tutorial approach, RailsSpace teaches you to build large-scale projects with Rails by developing a real-world, social networking website application. This essential introduction to Rails provides you with a solid foundation for creating any login-based website in Rails; coverage of newer and more advanced Rails features such as form generators, REST, and Ajax (including RJS); and a thorough and integrated introduction to automated testing. This package brings together 8 breakthrough primers on todays most valuable Ruby and Rails technologies  including five new digital Short Cuts worth $69.95 and chapters from The Ruby Way, RailsSpace and The Rails Way. Insiders information never before available in one place! The Rough Cuts service from Safari Books Online gives you exclusive access to an evolving manuscript that you can read online or download as a PDF and print. A Rough Cuts book is not fully edited or completely formatted, but you'll get access to new versions as they are created. The Ruby Way takes a “how-to” approach to Ruby programming with the bulk of the material consisting of more than 400 examples arranged by topic. SHORT CUTS are succinct, to-the-point, fast reads on new and existing technologies. Theyre digitaldelivered in Adobe Reader PDF. Theyre published quickly and provide the knowledge you need right away. Short cuts show you how to solve a specific problem and introduce you to new topics. Written by industry experts and best-selling authors, short cuts are published with you in mindgetting you the technical information you need now. This short cut focuses on a number of coding patterns which are useful when trying to get maximum speed out of performance critical sections of Ruby code. Anti-patterns, i.e. coding idioms which should be avoided in performance sensitive code sections, are also discussed and include details on how to transform such code to make it more efficient. When programmers develop a Ruby application they commonly experience complex problems which require some understanding of the underlying operating system to be solved. Difficult to diagnose, these problems can make the difference between a projects failure or success. This short cut demonstrates how to leverage system tools available on Mac OS X, Linux, Solaris, BSD or any other Unix flavor to resolve problems that are difficult to diagnose with the standard Ruby development tools. The Rails routing system has always been a key component of the framework, and with the introduction of RESTful routes in the past year, it has taken center stage. Fully programmable, the routing system governs the process of mapping request URLs to the appropriate controller action. In this short cut, youll learn techniques for writing custom routing rules, how to tap into the convenience and power of named routes, and the workings of the RESTful routing thats had such an impact on Rails development. If youre new to REST, this short cut will help you decide which parts of the REST paradigm you want to introduce to your application. If youre a developer with more RESTful experience, this short cut will introduce you to some refactorings that will give your application a cleaner, leaner code base, while also serving as a reference to much of the functionality REST has brought to Rails. This short will serve as a resource for any Rails developers curious about how Rails' plugin system can enhance their development process. It will explain exactly what plugins are, and how they relate the other components of a Rails application and the Rails framework. An e-book about design, philosophy, and appreciating beauty, Rubyism is a look at the way in which the grace of Ruby informs the design of Rails. This short is for the Rails programmer who wants to deepen his understanding of how Rails works, and gain a deeper understanding of the power of programming in Ruby. in Ruby. This short will serve as a critical resource for any developer, system/network administrator or business owner interested in understanding Mongrel and using it for development work or in a production environment.